As we grow closer to adoption…though it doesn’t feel like we’re any closer at all to getting the paperwork done…I am forced to face head on some fears and issues that have been shoved to the background since Ed and I made the decision in our dating days that ours would be an adoptive family. I should warn you early on that this entry is a mental release of thoughts, fear and emotions. It may not present solutions to the problems stated herein but is a definite vehicle to finding those solutions. As I solidify and process these thoughts, my brain will become more organized to pursue solutions to said problems. Now that the disclaimer is complete, let’s get on with it. I know that adoption is one of the most difficult things that a family can undertake. Inherent with adoption is loss, tragedy and grief on the part of the child. This can also be true on the part of the parents if infertility has led to adoption; however, that is not the case with us. We have come to adoption as a result of our faith, as a result of our desire to take in those who have no one and love them as our own–to love them in the way that God has loved us. Just as is the case with us and our adoption with God, these children will come to my home with significant trauma in their past and even their present. Though their past may have included abuse and neglect (to put it mildly) these children still love their birth parents. Their dysfunctional home is the only home they have known. Coming into my home–as healthy of a home as it may be–and calling my husband and me “Mom” and “Dad” will be an extremely difficult adjustment for them. These children will need significant emotional and psychological healing. On top of that, Ed and I plan to adopt a child with special needs–a child with either a mental disability or a physical disability. To say the least, this will not be any easy time for our family. 1/3 of adoptive families have a relatively seamless transition. 1/3 of adoptive families have significant challenges but are able to deal with them and/or overcome them. 1/3 of adoptive families collapse?! That is an absolutely HUGE number! I knew this process was difficult. I never considered that it would cause my family to collapse. I think I just had this underlying expectation that since I was doing God’s will, though the process may be difficult for a while, it would ultimately be successful and we would be one big happy family. I never even considered that might not happen. I know that being armed with information and being connected with those who have done this before, as well as being connected with professionals, increases our chances of being in the 2/3 of families with successful adoptions, but the chance of being in that bottom 1/3 still remains. How will this affect my other children? Will my daughter, Daniela, grow up to resent her parents because we brought in a child who destroyed the family? Will I grow to resent that child and I feel that he or she ruined our lives? I know, I know. That’s a horrible thing to think and most people would never even say it, but I have to be honest with myself. I am a fallen human being and I am capable of these sorts of thoughts and emotions. On the flip side, God is able to love all of His children unconditionally–regardless of how we behave. Something the Lord has been teaching me for the last several years is that I have to depend on Him for literally EVERYTHING! He can give me the ability to love this child. Furthermore, I have to look at the benefits my family would receive from adoption. These children will teach us all about the strength and vitality that God has created within the human race. They will give us an opportunity to serve selflessly and to love someone the way that God loves us. They will give us the opportunity to experience greater depths of the love of God, as God loves the “little ones” with a ferocity we can not imagine. And I’m sure there are a thousand other things I’m not thinking of right now. *Statistics courtesy of Dr. Karyn Purvis, Empowered to Connect. In the process of opening The Funky Lamp shop, I have realized that opening a small business is a SLOW process. I’ve been open for about a month and only have 13 items listed. There are a few factors that I can pinpoint that are contributing to this. The main one is the fact that I am a stay-at-home mom…or maybe I should correct myself…a work-at-home mom. The “mom” part is my top priority, so I’m ok with that slowing my business progress. Another factor I have discovered is photography. I can have new products all day long but if I can’t find the time to dress up while the sun is still out and my husband is home, find a good place to snap the shots, and find time to edit them, then I can’t sell them. While I think taking photos on a real person with a full outfit is preferable, I decided that it is not always possible, and therefore, not profitable. 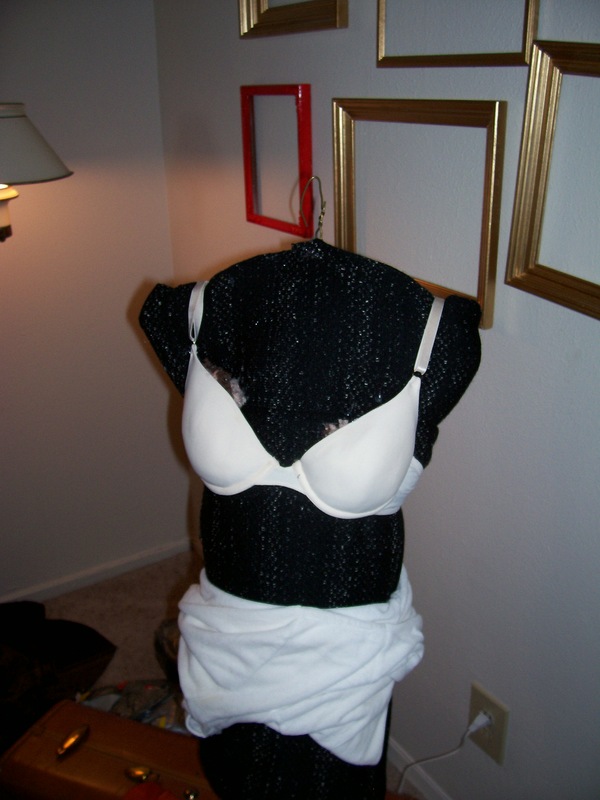 Furthermore, since I am trying to get this business off the ground with as little start-up cost as possible, I decided to make a mannequin on which to display clothing. 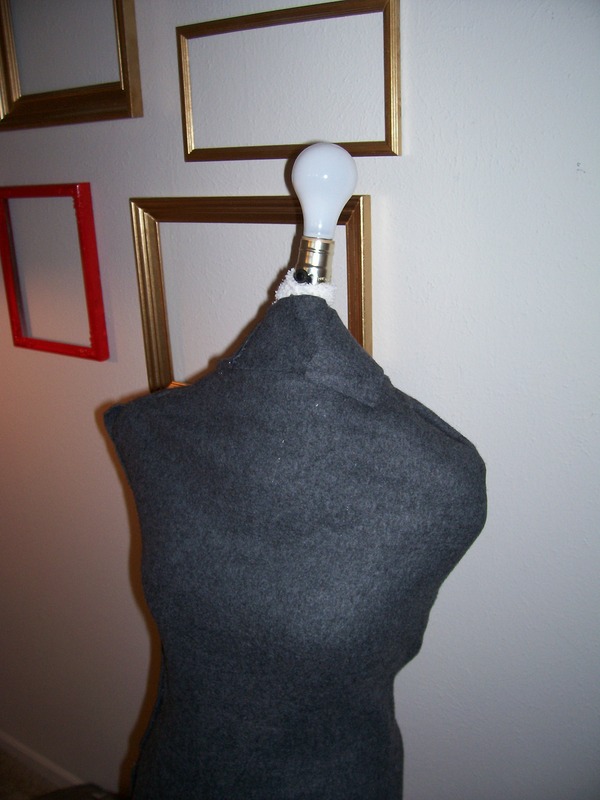 Besides the fact that making one is more cost effective, it also gives me the opportunity to creatively style my mannequin to match the unique look of The Funky Lamp. So, what do you do when you want to do something that you don’t know how to do? Google it, of c ourse. After thorough googling, I decided that a duct-tape dummy was the way to go. There are literally hundreds of sites with instructions on how to do this. 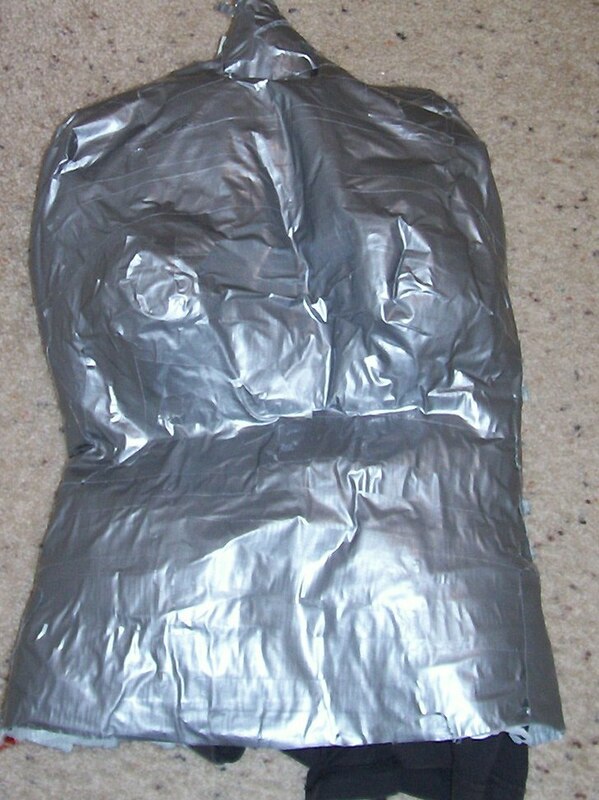 However, my duct-tape dummy ended up resembling Quasimodo with lumpy breasts. Not sure what happened. I guess my husband and I just don’t have the duct tape gift. So…back to the drawing board. I had a vague memory of reading a blog where someone made a dummy for her daughter out of batting and a blanket. After more googling, I located this lovely blog: Tea Rose Home. That’s an old washcloth sticking out at the top. I used it to construct the neck. All that was left was to cover her in fabric. I know you’re supposed to use a plain, neutral color for these things, but that wouldn’t we very Funky Lamp-ish, would it? I introduce to you…Stella. Why Stella? Not sure. I just like it and that’s reason enough for me. I really like the light bulb head. I got a call yesterday from a very good friend. She asked me why I haven’t written any blogs lately. My answer? I’m really bad at this stuff! So, thank you, Jordan, for keeping me accountable. During my conversation with “very good friend Jordan” we both admitted that we’re bad at follow through. You see (and I think I have discussed this in my blog before, but it bears repeating if for my sake alone), I am the visionary type…full of ideas…wonderful, alluring, attractive ideas. The problem is that once it is no longer an idea, but is an actual, practical reality, I’m no longer interested. Jordan is the same way…maybe that’s why we make such good friends. However, we don’t exactly motivate each other to follow through on the practical end, do we? That’s where my husband comes in. Ed is Mr. Practical. You need a list? He’s already made it. You want a plan? He’s probably already solicited you to make one. Thank God for Ed! Jordan hasn’t found her “practical half” yet, but I’m accepting applications from wonderfully more-than-amazing men. Relax, Jordan, it’s only a joke! I will keep my little nose where it belongs. I promise. Hehe! I, of course, agreed. It takes blood, sweat, and tears to be successful. I could have incredible ideas all day long, but without the work, I’m just full of hot air. What’s the moral of the story? Get married so that your “better half” can compensate for your weaknesses? NO! Of course not! The moral of the story is to get to know yourself and then learn from those that God has placed around you in order to be successful. None of us have the full package. We’re not supposed to. We’re supposed to live in community and learn from each other. Reach out to those around you who can help you. What are some of your weaknesses? Who could you learn from or seek encouragement from in those areas? 80 percent of prison inmates have been through the foster care system. Children are 11 times more likely to be abused in State care than they are in their own homes. Children died as a result of abuse in foster care 5.25 times more often than children in the general population. Something I found interesting was the fact that the article began, “A few pieces of information that really bring home the point that CPS is not taking care of their charges.” Now, I’m not here to defend CPS. I’m not here to make any sort of statement about CPS, but I don’t think we can lay the blame solely on their shoulders. I think we all bear a portion of that blame. I’m reminded of a famous quote from Edmund Burke: “All that is necessary for the triumph of evil is that good men do nothing.” I think that is certainly true here. Where are all of the non-abusive families willing to take children in? We know that abusive families are certainly a minority, so why do they account for the majority of foster families? Because good people are doing nothing. Because good people aren’t taking these children in, so virtually all that’s left are the dysfunctional families who will do it for the reimbursement check. Well, I’m determined to break the cycle. My family is going to do something. We are going to take these children in. Who’s with me? Twenty years from now you will be more disappointed by the things you didn’t do than the ones you did do. So throw off the bow lines. Sail away from the safe harbor. Catch the trade winds in your sails. Explore. Dream. Discover. I came across this quote today in a book I was reading. Man, I needed to hear that. Isn’t it inspiring? And so true. I’ve always said that when I die I want to be able to say that I gave my all for what I believed in. It’s the answer to all your doubts. “I’m just gonna give my all to what I believe in.” Stepping into a new venture in life is never easy, and I am attempting to step into several at once. Sometimes I think I quit everything I try. My husband was surprised when he heard me say that. He was surprised because I am known as a person of strong convictions. I know what I believe. I know why I believe it and nothing is going to change that. I have taken several leaps in life that seemed crazy to many. However, those are deep passions of the heart and soul. I’m afraid that on a superficial level–the level of day-to-day mundane things–I’m a quitter. Sure, I’ve been able to maintain the most monotonous, boring, even stressful jobs, but on my own brain-children? I give up. The truth is, I’m an insecure visionary. I’m full of ideas and I get really excited about the good ones when they come, but when it comes to implementing them, I’m not so faithful. Worse than that, I’m afraid they won’t work out and I’ll feel like a failure. But this time, I’m determined to stick with it. 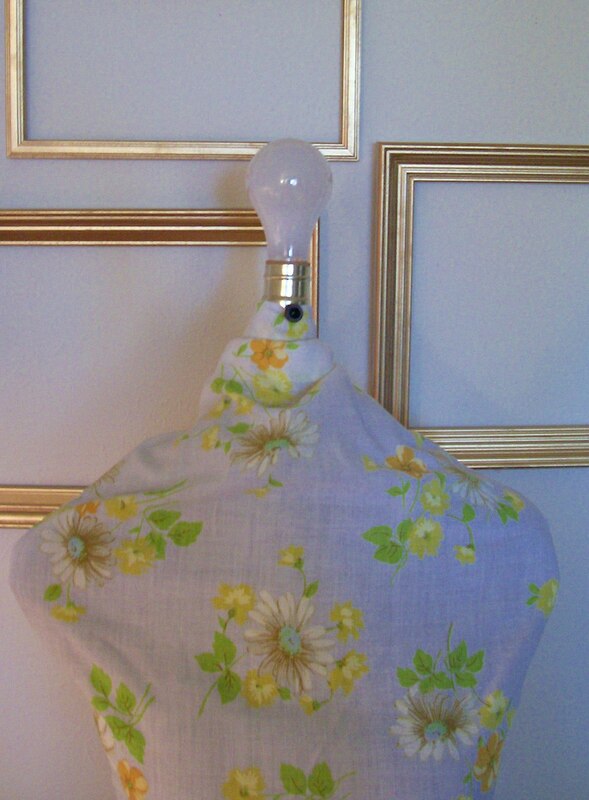 If The Funky Lamp fails, it won’t be for lack of trying. I’m going to give it my best shot and if it fails I’ll know it wasn’t because I gave up. I figure that I have a bonus this time. This time I’m combining the day-to-day mundane with the deep passions of my heart. This is about adopting children. Giving those who have no home, no family, a forever home and family. It’s worth the risk. The way I see it, it’s a win-win scenario. I learn not to give up, and I get the kids. Not bad at all. Does anyone besides me struggle with fear of failure? What is something you have always wanted to do, but have always been secretly afraid to do? I had intended to blog about my recent bedroom makeover and to share some photos of my beautiful new room. I’m so proud of it. However, today is an awful day for pictures…absolutely no sunlight coming through the windows. So, I’m afraid it will have to wait. I’m not quite finished with the makeover yet anyhow, but I’m just dying to share! Anyway, on to my actual topic for today. Many of you know that I had a my first baby a little over a month ago. Since then, I have really been struggling with my body image. That is something that I have always struggled with, but it has become more influential in my thoughts since giving birth. I know that exercise will help, but no matter what I do, in many ways my body will never be the same again. Ed is totally ok with that. I wish I was. I have been pondering this for months and it occurred to me recently that there is something wrong with our culture (well…probably a lot of things, but I won’t get into that). There is something wrong with our culture when we despite the changes that occur in a woman’s body once she reaches motherhood. Motherhood is one of the most noble things I can think of, yet we think it shouldn’t be displayed outwardly. I am proud to be a mother. That being the case, I should be proud of my post-partum figure. So I made a decision. I am going to be proud of it. I will wear my somewhat-larger hips proudly. No one can stop me. There. 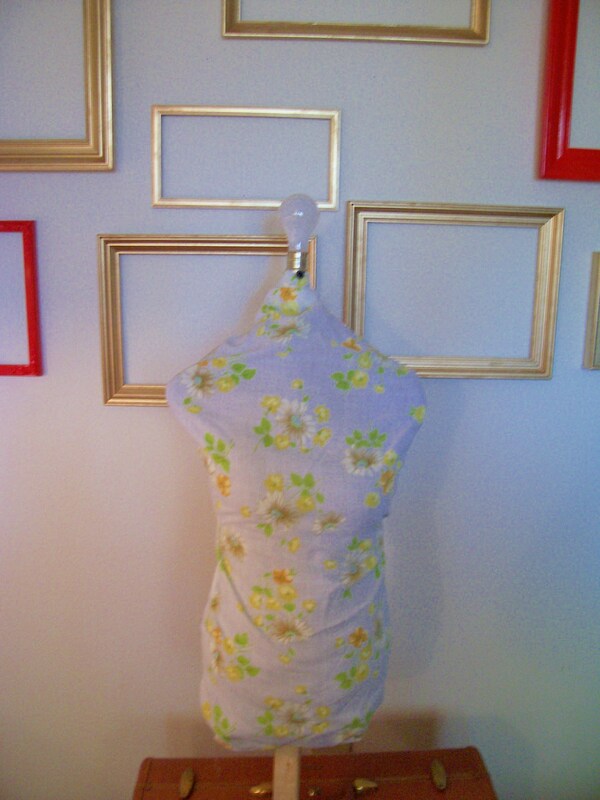 I have also decided that I will never edit any of the model’s bodies in my etsy shop. I refuse. I hate those photo-shopped pictures in magazines that only serve as fuel for young people’s eating disorders. I want my daughters to look up to real women with real bodies. We are hurting the future of our nation and the world by offering them ideals that are simply impossible to obtain. Every time I see one of those ads I want to scream, “SHE’S NOT REAL!” As it stands, The Funky Lamp only has one model…me. I think it is more tempting to edit my own body than someone else’s, but I promise you I will not. I may airbrush the occasional pimple from my face, but I will never edit the shape of anyone’s body. Girl Scouts’ honor.